"Deponency and Morphological Mismatches" by Matthew Baerman, Greville G. Corbett et al. Deponency is a mismatch between form and function in language that was first described for Latin, where there is a group of verbs (the deponents) which are morphologically passive but syntactically active. This is evidence of a larger problem involving the interface between syntax and morphology: inflectional morphology is supposed to specify syntactic function, but sometimes it sends out the wrong signal. Although the problem is as old as the Western linguistic tradition, no generally accepted account of it has yet been given, and it is safe to say that all current theories of language have been constructed as if deponency did not exist. In recent years, however, linguists have begun to confront its theoretical implications, albeit largely in isolation from each other. There is as yet no definitive statement of the problem, nor any generally accepted definition of its nature and scope. This volume brings together the findings of leading scholars working in the area of morphological mismatches, and represents the first book-length typological and theoretical treatment of the topic. It will establish the important role that research on deponency has to play in contemporary linguistics, and set the standard for future work. Dr. Andrew Hippisley was affiliated with the University of Surrey when this book was published. 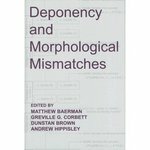 Baerman, Matthew; Corbett, Greville G.; Brown, Dunstan; and Hippisley, Andrew, "Deponency and Morphological Mismatches" (2007). Linguistics Faculty Book Gallery. 4.